Gaming, in general, thrives on good adventures. Whether it is a trek through Hyrule or a quest in Tamriel, the setting of a game is one of the core elements that make it memorable or forgettable. Over the past few decades, we have seen gaming evolve from text-based adventures such as Zork into the now popular fully formed open-world. Newer gamers might not be familiar with their roots, especially those who are less acquainted with PC gaming overall. There was a time, not so long ago, when a story-driven game wasn’t a rarity but, rather, a cornerstone. Today, we see stories take back-seats to great settings and that’s all fine and good. A good setting illuminates imaginary worlds making them believable and enjoyable; but before we had technology like we do today, for such a world to come to life we needed great characters, dialogue, and a clever enough narrative arc in order to draw us in. Adventure gaming had always been commonplace in PC gaming, whether it was in the aforementioned Zork or in such popular Sierra titles as King’s Quest and Space Quest. We’ve always had them, so adventures through stunning locations with intelligent storylines weren’t necessarily hard to come by. But it wasn’t until LucasArts came on the scene that we began seeing masters of their genre emerge. During the mid-to-late 1990’s we saw Tim Schafer and other auteur developers come out with beautiful and intriguing games, lifting not only PC gaming, but gaming as a whole into what is now considered an artform. Schafer is well known by gaming enthusiasts, but still not yet known by the common core. 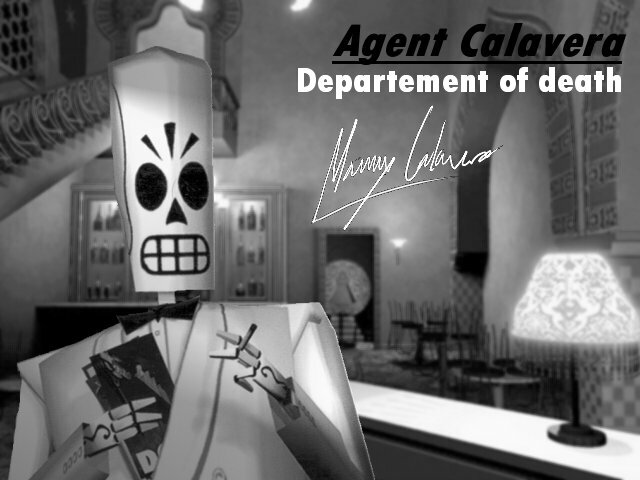 He has a host of hit titles, from Full Throttle to Psychonauts, but perhaps still yet is best known for his masterpiece: Grim Fandango. 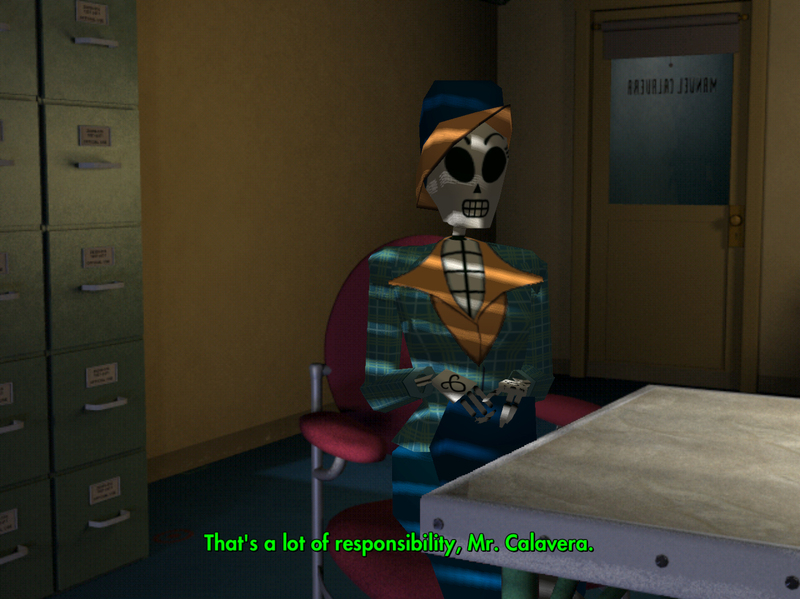 Originally releasing for the Day of the Dead in 1998, Grim Fandango upped the ante on all story-driven games. With arguably some of the most memorable characters and a fantastic artistic design paying homage to that holiday’s culture, Grim Fandango won the hearts of both fans and critics alike. It won dozens of Game of the Year awards and is forever cemented in gaming history as one of the best games released in this industry. But how would it hold up today? This is the question which has faced many people since it was announced last year that there would be a remastered cut of the game. Sure, it was excellent in 1998, but much has changed since then. The game was visually impressive at the time due to its noir style, but it used static locations for a backdrop. It also played well enough, but it used the now laughable tank control system. Beyond that, story-driven games are a dime a dozen today. Even though storylines in games are often forgettable and sometimes downright bad, we still have them in most games on the market. It’s the old problem films face in light of time and progress in their medium. Yes, it’s true, a film such as A Gentleman’s Agreement was good in the 1940’s. So good it went on to win the Academy Award for the year’s best motion picture. But today, it seems so archaic, almost offensive at times, that we can chalk it up to a product of its time. 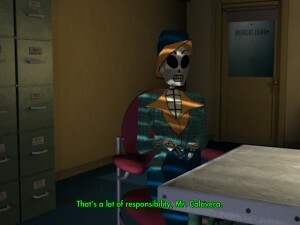 Games from the era of Grim Fandango are often subject to the same sort of issues for the same sort of reasons. We’ve just moved on. Safely, I can say that having played the original release in 1998 and now having played the remastered cut in 2015, Grim Fandango is still an excellent game. It holds up well and, in spite of its technical inefficiencies, is undeniably a masterpiece and even more undeniably one of the best games you’ll play this year. As Manny Calavera, a lowly employee of the Department of the Dead, you are fed up with your lot in life. You are stuck. You need to work off your debt. You see good leads passed on to other salesmen, you see the corruption of your bosses and your agency, you see that nothing ever seems to go right no matter how hard you try, but… you stumble upon something: a conspiracy. Indeed, there is a conspiracy afoot and through a series of fortunate and unfortunate events, your lot changes and it is now your mission to shed light on the vast corporate conspiracy in your midst. Through four years in the underworld, in the land of the dead, you experience one of the best written and most exciting adventure games ever made in gaming. It is a clever, exciting, and all together wonderful ride that brings out the best in comedy writing for games as well as setting and design for adventures. If you are a skeptic, unsure whether a game as old as this is worth your time and money, it’s a happy occasion to say this is releasing at only $15 on both Steam and the PlayStation Network. Grim Fandango is a steal at this price and given the small series of upgrades, it has never looked or played better than it does in 2015. 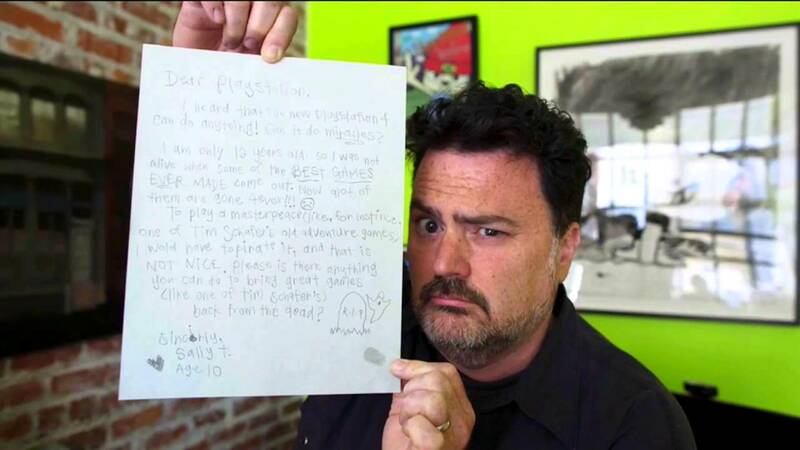 Added to the original game is a fun commentary by Tim Schafer, the game’s developer. Also, there are small graphical updates which make it look nice, giving it dynamic lighting and other smooth-overs which are certainly welcome. Most importantly, however, is that you no longer are subject to the dated tank control system. While that may have worked in the late 90’s, it is almost unplayable in the modern era. Instead, you are granted a camera-relative control scheme which moves Manny around in a logical, cohesive fashion. 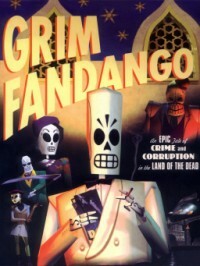 Generally speaking, this is the best version of Grim Fandango around. That much is obvious. But what’s not obvious is whether it’s worth your time or money. There are so many good games out there and even more than that, there are so many classic games which keep getting remastered and put out for another release. Unequivocally, yes. It is most certainly worth your time and money. There is a distinct reason this game won over critics and fans in the late 90’s, sweeping awards ceremonies and becoming an iconic game in its genre. 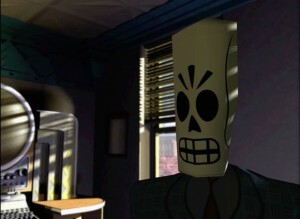 There are few games as clever, fun, or exciting as Grim Fandango and it is such a welcome re-release at a time when adventure gaming is making a strong comeback. Though praises are high, there are some who criticize the game for its still dated sentiment and design. There was no update of the backdrop art nor was there any addition of an autosave feature. Further, there are puzzles people have suggested are archaic or nonsensical. All that said, if you can stomach these so-called flaws, you’re in for a treat. To be perfectly clear, this is a must-have game whether you get it for PC or for your PS4 or Vita. We had the chance to play it on both Vita and PS4, and have played it many times through the years on PC, and know for sure that this is the best it has looked or played so far. Manny is back and better than ever. Downloaded via PlayStation Network for both PS4 and PS Vita.